When making an investment in any technology platform, it’s important to understand its value — both in terms of cost and resource benefits. In this commissioned total economic impact (TEI) study, Forrester Consulting examines Heap’s platform, including time to deploy, advantages, associated risks, and potential return on investment. Forrester’s findings are based on research and interviews with a publicly traded financial services technology company with multiple years of experience using Heap. The content ultimately provides organizations with a comprehensive framework for evaluating this data analytics solution. 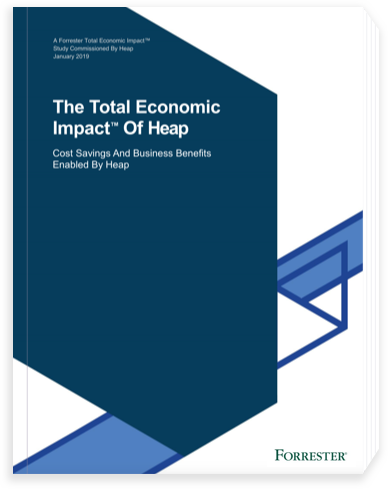 Get the full study, The Total Economic Impact™ Of Heap, to learn about the business benefits and cost savings enabled by Heap. Data capture and analysis isn’t just a good strategic decision. It’s an excellent way to drive agility and competitiveness for your business. For example, product teams leverage Heap’s elimination of manual tagging labor, retroactive data, robust ad hoc analytics, and live insights. Subsequent financial analysis by Forrester found that the company experienced three-year benefits totaling $4.6 million, a 361% return on investment, and a payback period of less than six months. Learn more in The Total Economic Impact Of Heap.